October is made for masks. And I love it. That’s why I can be sweet, relatively innocent L.C. Glazebrook here at Zombiepoolaza and simultaneously be the creepy old Digger over at Bookgasm. I can be a fairy or a zombie, a creature or a clown, and all I have to do is change my mind. And a little make-up. October is for the kid inside us, and the monster inside us. The angel inside us, or the demon. It’s all play, and it’s all safe. I’d rather risk the legendary apple in the razor blade any night over watching a silly ball descend in Times Square on New Year’s Eve with 100,000 drunken strangers, muggers, and celebrities packed onto fifty square feet of real estate. Those of us who still love the world of imagination (which I’ll bet includes you, or you wouldn’t be reading this) are always eager to try out a new role or revisit some past persona. All it takes is slipping on a mask and dreaming, wishing, wanting. Some people lose that magic. We call them “grown-ups.” They are out there fretting over mortgages, stock portfolios, politics. They live to get old. They look forward to it, the safety and security of a big fat pile of material goods upon which to die. The rest of us get to live in the land of make-believe. The forests are dark and scary, the meadows full of flowers and dandelion snow. The clouds are white and soft or dark and moody. The distant kingdoms always contain evil overlords or benevolent white witches. We visit those lands in books and movies, and we visit them in our sleep, and when we’re alone, and when we see something that triggers a magic memory. As a writer, I get to visit those lands as my life’s work. Some writers tell me life gets in the way of their writing, and I am always amazed, because writing IS my life, as much a part of my mask as anything. It might even be the most real—or the only real—thing about me. That’s why I’m not afraid to stagger into the land of teen witches (October Girls), haunted hotels (Speed Dating with the Dead), spooky churches (The Red Church), or scary caves (Drummer Boy), or zombie landscapes (Murdermouth). I hope you’ll come visit them with me, whether I am L.C., The Digger, or Scott. You can wear whatever mask you want! L.C. Glazebrook is an art teacher in Batesville, Indiana, the casket capital of the country. She was kicked out of Catholic school in seventh grade but has since recovered. 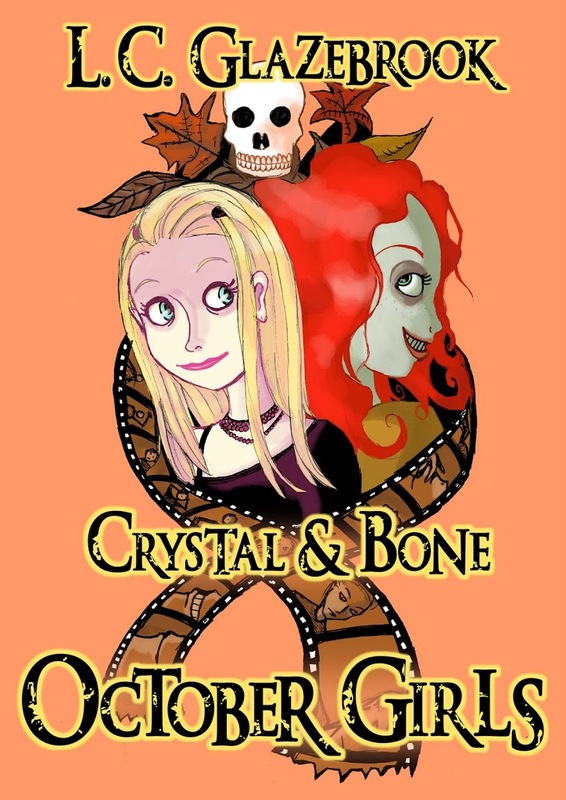 Crystal & Bone is the first book in her October Girls series, and she’s also co-written the story collection Flowers with Scott Nicholson. Thank You For The Flowers is a collection of thirteen stories of suspense and imagination by award-winning author Scott Nicholson. 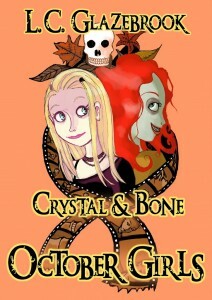 The stories are a mixture of mystery, fantasy, and ghost stories. All have previously appeared in national publications. I’ll be giving away a signed copy of Thank You for the Flowers paperback (by Scott, not LC!) under the same rules as the other Zombiepalooza rules. Please count me in for yet another one of your incredibly generous giveaways and thank you so very, VERY much!!! Great post! I read to escape the “Grown-up” life. I’ll be a stop on Scott’s kindle giveaway tour on October 23rd! This is a great bonus. reading your blogs always makes me smile 🙂 Thanks. I will be coming dressed as Alice from Resident Evil!!! I already have Thank You for the Flowers (great stories! ), so I’ll pass on that and let someone else win. I’m reading that book right now. Great cover! It’s fun and appeals to my teenager psyche–sorry I never grew up and now I’m too old for growing up.